St. John’s PCC is sad to announce that our Vicar Rev. Shirley Devine will be taking early retirement on ill-health grounds. Her last day will be Sunday 15th July. We will continue to pray for her and her family and wish them well in the future. At that time, we will be entering a period of Interregnum, before a new incumbent can be appointed and St. John’s PCC will be working with our Archdeacon to ensure this is done as speedily as possible. There is a message on the Vicarage telephone number 01706 629803 advising callers where they can obtain assistance. Contact with St. John’s church can also be made on email via this website. We are pleased to announce that our Priest-in-Charge, Rev. Shirley Harrison, was married at St. John’s church on Saturday 10 December to Terence Devine. St. John’s PCC are pleased to announce the appointment of our new Priest-in-Charge, Rev. Shirley Harrison. She will be joining us probably around September or October, and will also be responsible for St. Luke’s Church. She comes to us from St. Andrew’s church in Redruth, Cornwall, where she was appointed as a Team Vicar in September 2011. 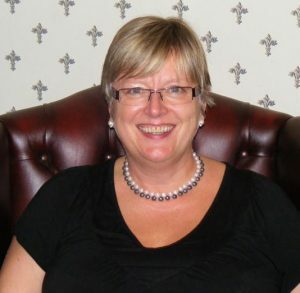 Ordained in 2006, she is originally from the Oldham area, where most of her family still live. She was a curate in Saddleworth and then Priest-in-charge at Christ Church, Denton & St. George’s Dane Bank for three years up to 2011. She was previously employed in various IT posts, including Greater Manchester Police. She has a very active interest in schools, various charities, music groups and by all accounts is a renowned mezzo-soprano and bakes very good pasties! Her husband sadly died in 2006 and she has a son Max who goes to Cambridge University in October (grades permitting; if not, it will be Exeter). She also has 2 married daughters and 4 grand-children, with more on the way. They all live in and around Oldham. She is required to serve three months notice at her current Parish before joining us. We look forward to welcoming her to our Parish and wish her every success. At least she will be free of all the building and decorating work we have endured over the last three years and especially during Interregnum. We must thank Tony Williams and his committee, and especially Denise & Lesley who were on the Interview Panel, and thank God for this heavensent opportunity. Please pray for Shirley and the people of St. Andrew’s Parish she is leaving. A new era dawns for St. John’s and St. Luke’s in Heywood. The decorating and the carpeting of the main body of the Church and renovating the Parish Room floor have now been completed. New chairs have also been obtained for the Parish Room. 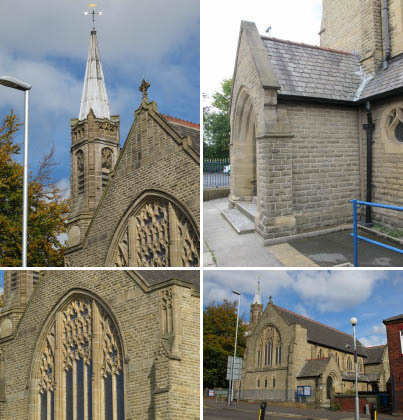 Following the successful completion of the west wall project we are pleased to announce that due to the project coming in under budget as well as our successful appeals for grants (>80% of total raised) and fundraising ,we are able to continue work on our church. The monies we have available must be spent on church building or renovation projects and cannot be used for the day to day financial affairs of St. John’s. There are four projects that the P.C.C. have approved. The first two, carpeting of the church and renovation of the parish hall floor need to be done not only for appearances sake but also on the dreaded health and safety grounds. Loose frayed carpet and loose parquet blocks need to be replaced or repaired and fitted properly before an injury occurs. Decorating our church and renewing the lighting within church are the other two projects that have been approved. As far as I know the church was last decorated about twenty five years ago and the difference in wall colour between the newly decorated west wall and the rest of the church certainly indicates that twenty five years is long enough between coats of emulsion. The church re-decoration and fitting of the new carpet will commence on Tuesday 29th March,i.e. after Easter,the parish room floor around the same time. The lighting can only be done later in the year after we have obtained a faculty. As many within the congregation have commented our lights within church are unsatisfactory and the irregular flicking on and off of individual lights is most irritating. This will be resolved by replacing the lights and using LED bulbs for illumination. These bulbs use only a fraction of the electricity needed to power our current system and we should see a significant improvement both visually and financially. I hope this information about plans for our church is helpful and I would like to take this opportunity to thank both our grant raising team and our buildings committee for their incredible efforts on our behalf. I thought I would update you as to the progress of work on our West Wall. You will have no doubt seen for yourselves that the scaffolding is now well in place. There were some difficulties during its erection which resulted in it taking almost three weeks when the plan was for it to be done in just over one week. The large windows in the West Wall have now been removed and taken to Pendle Glass workshops in Padiham, Lancashire where they are being restored and repaired. This is a big job which will take up to 12 weeks. The first coat of plaster has been applied to the internal wall with a second coat later this week. The plastering work is largely dependent upon how long it takes to dry out, but the reassurance is that the wall itself was dry and not as damp as we expected. At the first site meeting held on Thursday 19th February, we agreed that, the chancel windows will be included in the project, and they too are to be removed in the next week or ten days. and will be repaired and restored on site and new frames installed at the same time. By doing this work now, it will result in a cost saving to us later of around £5,000. Also, several provisional sums and contingencies had been included in the contract price of £124,000 (inc VAT) which we now hope will not be called upon, as some of these items do not need doing. We will however, almost certainly come up with other work which will need additional expenditure we hadn’t expected at the start. One such issue is that the ridge tiles will also be re-pointed as the contractors can now see potential areas of water leaks. We shall have to see how the finances work out but I can reassure you that the project is now back on schedule and well within budget at the present time. The pointing and repairing of stone externally is also underway, and the church spire is being done this week. The weather vane on the top is to be painted black with gold fingers. There are three difficulties we did not totally expect. The ineffective convector heater at the foot of the west wall, and the identical one near to the access ramp door have been removed and new ones will be installed when the work is complete. The clock face on the north side was due to be repaired and repainted but due to its very poor condition the Building Committee followed the advice of the church architect and instructed that it should be removed. The church bell (yes we do have one) was also due to have its supporting beams repaired but it was in a much worse condition than was originally thought and would prove a very expensive job. As the bell hasn’t been used for about 40 years, we are currently debating whether it is brought down and after being cleaned, displayed in church, or merely left in a secure state in the bell tower. 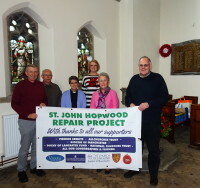 Regular update reports are being made to our Grant providers who need to be kept informed of our progress and as a result of the appeal, we did get 10 volunteers to become friends of the National Churches Trust. An acknowledgement and thanks for their contributions has been posted on our website. So you can see the hoarding around the scaffolding is hiding a tremendous amount of work which is going on. The Building Committee do believe we made the right choice of contractor in Lambert Walker. They are totally professional and respectful of the church and keep us updated on an almost daily basis as to their progress and better still, clean up after they have finished work daily. When you see the work they are doing elsewhere on cathedrals, churches and even castles(!) you have to be impressed with their credentials. If the work continues on schedule and we hope it will be finished by the end of April. We are planning a service of Thanksgiving on a Sunday in June. Regrettably, the contractors, Lambert Walker Conservation went into administration, which has caused a serious delay. After considerable negoiations with the Administrator and other parties, an agreement has now been reached for Lambert Walker Ltd to buy the contract and complete to works. It is hoped that work will restart on Monday 13 July. We will wait and see. Work has recommenced with the dismantling of the interior and exterior scaffolding. The church looks like a church again. Some ground level pointing needs to be completed together with final work on the Baptismal Windows and other agreed items including remedial work on the Chancel Windows. Remedial work has finally recommenced at a pace, with replacement of the stone slab by the West Wall Door being carried out and pointing of the West Wall being completed. The Chancel Windows have been removed for cleaning and repair. The boarded up windows does make the Chancel look gloomy, but, hopefully it should not be for long. With a great sigh, the Chancel window frames have been repaiered and the leaded lights cleaned and installed. What a difference it has made. Over 100 years of grime removed..An excellent job carried out by the glass contractors. We are virtually finished now. A small amount of pointing to be finished and the Baptismal Windows to have polycarbonate protection. Some additional radiators are to be installed at the rear of the Church, however the dreaded Faculty has to be obtained before work can commence, however the worst is over and we can now have our Church back again. Photos below of some of the finished work. Aat long last our West Wall Project is finished, plus additional items for improving the heating. Our congregations, this winter and future winters, will, if nothing else, be warm. All the heartache of the last 12 months are rapidly being forgotten. We have a vastly improved Church, thanks to all involved, especially the generous donations from our congregation and others, plus the various grants. Thanks also to the builders who have done an excellent job and to our archtects for their diligence and guidance.